Thursday Thoughts on Life – What is Local? 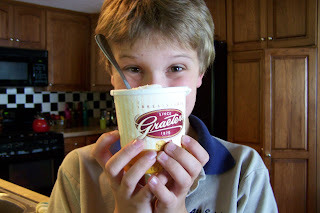 This week we enjoyed fabulous Graeter’s ice cream! An old friend and I have had a friendly college football bet over the years. 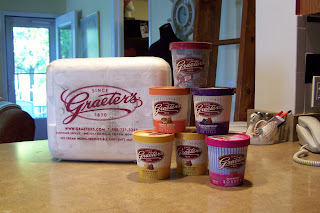 And, thanks to his alma mater’s team, I won a case of ice cream delivered to my door! This ice cream was born in Cincinnati and we have enjoyed it on trips to cities in southern Ohio. But it is not easily found up here in Cleveland. I love things that are unique to a locality. Sure, it is exciting for a company to be sold nationally, but there is something special about something you can’t buy at the grocery store every day. I grew up near an amusement park which closed when I was very young.. But the custard, the popcorn balls and the candy kisses. Oh, they were delicious! 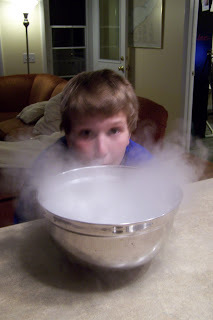 The candy kisses were shaped like salt water taffy but were sweeter, harder, chewier. The Humphrey Company still makes them and the taste of them evokes so many memories. I love to find what makes certain parts of a city or our country unique. I don’t like the homogenization of our country. When I travel and see one strip mall after another with all the famous chains I find it boring. Show me the mom and pop restaurants and shops. I’ll never forget when my husband took a business trip to Canada and I asked him where he was eating….some chain restaurant. So now when we travel and I’m ready for McDonald’s he exhorts me to find something unique. I love to find little Italian restaurants and have found old ones in Niagara Falls, Evanston and Washington, D.C. On a trip to Chicago with my parents we found a neat little restaurant called Eli’s. Jackets were required and my dad didn’t have one so they loaned him one. Every time we went to Chicago we went to that restaurant. When I took my family there a few years ago I was surprised it was no longer there due to a hospital expansion project. The big news locally was that Yuengling beer was now being sold in Ohio. People used to travel to Pennsylvania to buy it. Some of the great local products are maple syrup, Great Lakes Beer, and fiber. Did you know Ohio has more alpacas than any other state? It’s one of my favorite questions to ask people that I meet. What’s unique to the area in which you live? I love location specific foods too! To me living in New England I think we are famous for our seafood and chowder. I know that you can get seafood all over the country. But let me tell you, sitting in a little restaurant right by the ocean eating something that was caught earlier that day- there is nothing it. And different parts of NE have different seafoods they are famous for. There is also a really amazing ice cream shop in my city. They have just a few locations (3 I think) sprinkled around the state. They make amazing hot fudge. It’s the kind of place where if you’ve lived here and moved away it’s the first place you go when you come back to visit.